Rory McIlroy endured a frustrating day in the Memorial Tournament as pal Graeme McDowell stormed into contention for the $7m Italian Open. The Co Down man's patience was tested at Jack Nicklaus' Muirfield Village, where he twice found water on the back nine and didn't hole a putt longer than six feet as he opened with a two-over-par 74 to trail Mexico's Abraham Ancer, Chile's Joaquin Niemann and Japan's Hideki Matsuyama by nine shots. McDowell (38) has only just returned to the world's top 200 following his share of 12th at Wentworth last week, but he showed further signs that he's coming back to form with a five-under 66 that leaves him just three shots behind Robert Rock, Laurie Canter and Richard Sterne. Despite hitting just one of the first eight fairways and having to deal with a two-hour storm delay, he made two birdies and two bogeys to turn in level par before playing the back nine at Gardagolf in five-under. Rock, Sterne and Canter shot 63s to lead by two shots from an eight-strong group that includes Ryder Cup players Rafa Cabrera Bello, Thomas Pieters, Ross Fisher and Danny Willett. Paul Dunne, who can secure his US Open spot in Sectional Qualifying on Monday or by making the world's top 60 by June 11, made seven birdies in a rollercoaster 69 to sit a shot outside the projected cut. As for Pádraig Harrington, he made three birdie twos in a five-birdie round, but finished with a double bogey six for a level par 71. 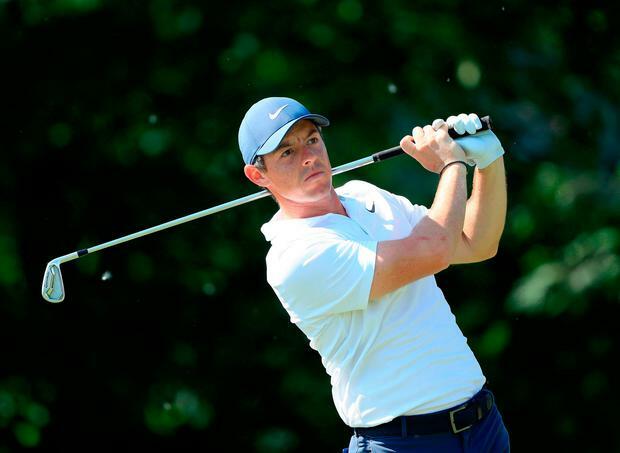 It was just as frustrating for McIlroy in Ohio, where he birdied the sixth from four feet, but bogeyed the short eighth and followed a birdie from six feet at the 13th with a sloppy double-bogey six at the next. Opting for an iron from the tee, he hit it left into a water hazard before three-putting from 12 feet. He then hit another tee shot left into water at the 18th to finish with a bogey. It was also a frustrating day for Shane Lowry, who was cruising at two-under after birdie twos at the fourth and eighth but signed for a one-over 73. After driving out of bounds at the ninth to run up a double-bogey six, he dropped another shot at the 10th and saw birdie fours at 11 and 15 cancelled out by bogeys at 14 and 17. Mexico-born Texan Ancer and former world amateur No 1 Niemann took advantage of receptive morning conditions to fire seven-under 65s before being joined late in the day by Matsuyama. Tiger Woods is seven behind after a grinding 72. Struggling with a stiff back, Woods bogeyed the par-five 11th (his second), double-bogeyed the par-five 15th after carving a drive out of bounds and then dropped another shot at the 16th to be four-over after seven holes. But he birdied the 17th and the second and followed a three-putt bogey at the fourth with three birdies in a row from the fifth to get back to level. "I fought back," said Woods (42), who kickstarted his comeback by hitting a spectacular, 247-yard three-iron to the par-five fifth, then birdied the next two holes before getting up and down from 60 yards for par at the last. "I wasn't rotating very well. (My) back was tight but I was able to make a few tweaks in my swing and lo and behold, I was able to make some good swings on my back nine and turn the whole thing around." Four players have a chance to end the week as world No 1 but while current No 1 Justin Thomas matched Woods with a 72, England's Justin Rose, who will take over with a win, shot 71 as Dustin Johnson shot a 72 and Jordan Spieth a 75. Meanwhile, Tullamore's Stuart Grehan carded one of just five bogey-free rounds in the Swiss Challenge, posting a two-under 69 at Golf Sempachersee to share 25th with Cormac Sharvin as Germany's Marcel Schneider shot 63 to lead by two shots. Gary Hurley's 70 leaves him just inside the cut line, but Jack Hume (71), Ruaidhri McGee (71) and Michael Hoey (72) have work to do. In US Women's Open at Shoal Creek in Alabama, where Irish amateur Olivia Mehaffey was among the late starters, Thailand's Ariya Jutanugarn shot a five-under 67 to lead by two shots in the clubhouse from Americans Danielle Kang and Michelle Wie.